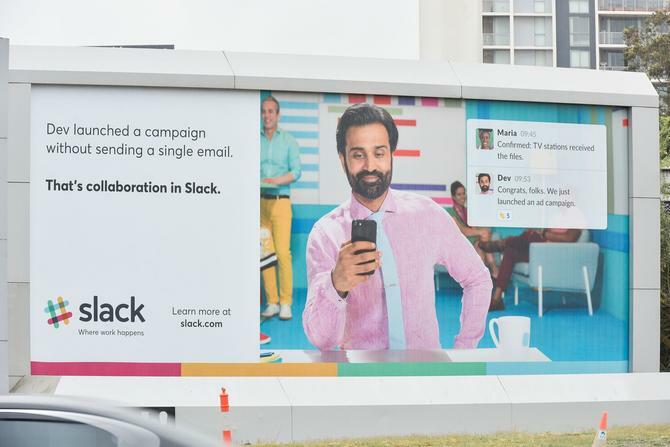 Slack’s inaugural Australian out-of-home brand campaign is just one step in a wider multi-channel, hyper-local strategy aimed at taking the collaboration platform to the masses, its global VP of marketing has told CMO. Earlier this month, Slack launched its first Australian brand-led campaign, two years after the business set up shop in the local market. Running through November, the outdoor-based executive is oriented around the journey knowledge workers take when undertaking domestic travel, and extends across out-of-home billboards and airport advertising in Sydney and Melbourne and Qantas domestic terminals, as well as 1900 in-office screens across buildings in Sydney, Melbourne and Brisbane CBDs. The creative features short videos and static images which aim to show how Slack enables collaboration and more agile decision making by bringing together the right people. Slack VP of global marketing, Kelly Watkins, told CMO launching the brand campaign was the next step in the tech vendor’s APAC growth after its Melbourne office debut in 2016. The company claims to have 8 million daily active users across 50,000 organisations globally. “In the past two years, we’ve seen a real surge in demand from Australian businesses for collaboration tools, such as Slack, as they seek out better ways for teams to work together,” she said. “With a strong and growing customer base, Australia is an important market and a key investment focus for us. To date, Slack’s uptake locally has largely been organic and via word of mouth. Now five years old, the vendor claims to be one of the fastest growing business apps to date, evolving to become a collaboration hub for companies of all sizes, across all industries. The Australian brand campaign also aims to strike a balance between global presence and local thinking, a mantra Watkins said the team already put into practice via hyper-local campaigns in the US. In addition, Slack is investing in other local marketing initiatives. Watkins pointed to its digital strategy as an example, noting investments in a broad range of online programs to drive increased adoption of Slack, as well as search, social and digital advertising.